A Chicago-based group that claims to “stand against hate” has contributed hundreds of thousands of dollars to organizations identified by the Southern Poverty Law Center as “anti-Muslim extremists,” tax documents reveal. According to an investigation by the Chicago chapter of Jewish Voice for Peace, the Jewish United Fund of Metropolitan Chicago, also called the Jewish Federation, gave nearly $650,000 to Daniel Pipes’ Middle East Forum between 2011 and 2014. The group also contributed $26,000 to Steven Emerson’s Investigative Project on Terrorism during the same time period. Emerson and Pipes have a long history of disseminating forged or false information with the aim of maligning Muslims in the United States. In total, between 2011 and 2014, the Jewish United Fund gave $784,000 to organizations with documented records of promoting Islamophobia. The contributions were disclosed in the Jewish United Fund’s filings with US tax authorities. In addition to contributing large amounts to these anti-Muslim groups, the Jewish United Fund received $5.1 million in 2013 through Donors Capital Fund, an organization that allows donors to anonymously channel funds to controversial conservative groups. The Center for American Progress, a think tank that conducted a seminal 2011 study of how anti-Muslim groups are financed, names Donors Capital Fund as one of the leading bankrollers of Islamophobia in the US. Donors to the Jewish United Fund, which raised more than $83 million in 2015, may not be aware of its contributions to what has been termed the Islamophobia network – a tight-knit group of individuals and organizations that has played a key role in disseminating anti-Muslim propaganda in an effort to influence policy. Jewish Voice for Peace says this network laid the foundation for the current surge in anti-Muslim policies being pushed by President Donald Trump’s administration. Pipes’ and Emerson’s groups receive funding from the same sources as Frank Gaffney’s Center for Security Policy, which has played a central role in influencing anti-Muslim policy among leading Republicans, including Trump. “The Jewish United Fund is one of the largest, most visible and most vocal Jewish organizations in the country,” Jewish Voice for Peace Chicago’s Lesley Williams told The Electronic Intifada. The Jewish United Fund’s stated mission is to give “help and hope to the most vulnerable” without regard to religion. It also promotes “interfaith partnerships” and claims to support Muslim communities. 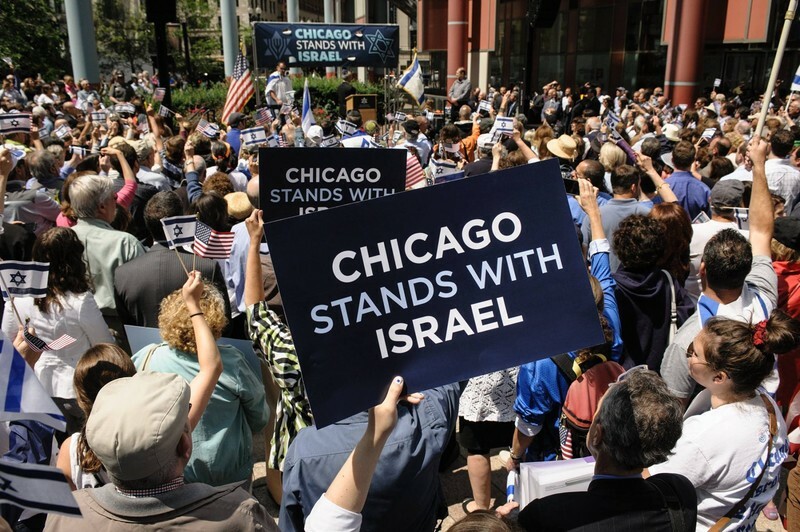 In February, Jewish United Fund president Steven Nasatir called on Chicago residents to “stand together to say ‘no’ to all forms of hate,” citing a surge in attacks on Jews, Muslims and Black churches in the US. Pipes’ Middle East Forum is a clearinghouse for ultra-rightwing and Islamophobic ideas, which “promotes American interests in the Middle East and protects Western values from Middle Eastern threats,” according to its stated mission. The Southern Poverty Law Center, a group that monitors far-right extremism, notes that Pipes has endorsed the internment of Japanese Americans in concentration camps during the Second World War as a model to use for Muslims in the United States. Anders Breivik, who killed 77 people in Norway in 2011, cited Pipes and Emerson numerous times in his manifesto justifying his massacre as necessary to save Europe from a Muslim takeover. In December, the Jewish United Fund partnered with several Syrian American groups for an event on Syrian refugees, who have become the main target of anti-Muslim rhetoric as well as the travel bans imposed by Trump. That event appeared to be part of a broader push by the Jewish United Fund to promote itself – and Israel – as engaging in “humanitarian” work related to the Middle East. The Jewish United Fund addresses the Syrian crisis “through humanitarian efforts while simultaneously advocating for the further oppression of Palestinians under Israeli occupation and apartheid,” National Students for Justice in Palestine charged. Indeed, the Jewish United Fund and Nasatir have long shared Daniel Pipes’ and Steven Emerson’s priority for combatting criticism of Israel and disparaging Palestinians. In 2010, the organization helped establish the Israel Action Network, a multi-million dollar effort to thwart the boycott, divestment and sanctions (BDS) movement in support of Palestinian rights. It also organized pro-Israel rallies during Israel’s 2014 bombardment of Gaza that left 2,200 Palestinians, including more than 550 children, dead. The Jewish United Fund’s funding priorities in 2016 included “strengthening the US-Israel relationship” by combatting BDS. In 2015, the Jewish United Fund backed one of the country’s first pieces of legislation that seeks to penalize companies or groups that support a boycott of Israel. Last April, the group sought to conflate criticism of Israel with anti-Semitism by supporting a letter sounding the alarm over an alleged surge in anti-Semitism on US college campuses. The letter, written by a congressional task force on anti-Semitism, was exclusively concerned with the increase in “anti-Israel” and BDS campaigns on college campuses. It suggested the Department of Education might be failing to investigate anti-Semitism under Title VI of the Civil Rights Act by ignoring speech critical of Israel. It calls on the Jewish United Fund to publicly address its “funding of anti-Muslim hate groups” and to cut off all such money in the future.